In this September 2012 photo, Occupy Wall Street protesters make their way to Broadway at the start of their Saturday march to Zuccotti Park, the first planned march as part of three days of events to mark the one-year anniversary of the movement. 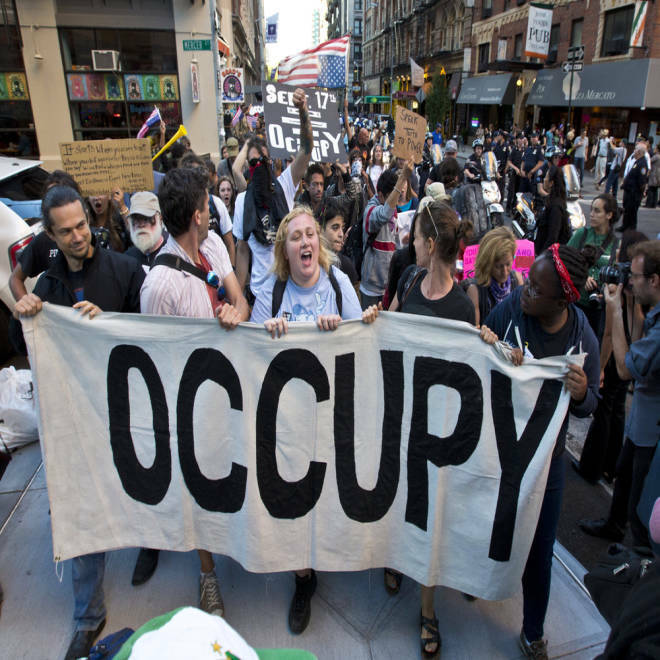 Occupy Wall Street took center stage last fall, galvanizing thousands of people across the country to heed the call, "We are the 99 percent," set up camps in parks and squares, and join the fight against income inequality, corporate greed and government corruption. Now the movement gathers again in New York to mark the one year anniversary of what was started in Zuccitti Park. An Occupy Wall Street spin-off group has bought up $14.7 million worth of Americans' personal medical debt and forgiven it over the last year as part of its Rolling Jubilee project, the group announced Monday. The Rolling Jubilee project, organized by Occupy Wall Street's Strike Debt group, has so far spent $400,000 to buy the debt, in the process relieving 2,693 people of the money they owed for medical services Occupy thinks should be free. "Think of it as a bailout of the 99 percent by the 99 percent," a post on the Rolling Jubilee project's website said. The project, which launched on Nov. 15, 2012, raises money through small, individual contributions, and then uses that money to purchase distressed and defaulted debt from the lenders, who in this case are hospitals or medical groups. The lenders are willing to sell it very cheaply, often for less than five cents on the dollar, because they think there is little chance they will be able to collect. Andrew Ross, a member of Occupy's Strike Debt group and a professor at New York University, said the group was able to buy debt at a 50-to-1 ratio. The group receives almost no information about the people whose debt they buy - only an address, Ross said. The group mails a letter to each address explaining the project and that the person's debt has been "canceled," Ross said. The group does not work directly with debtors. "One person wrote back and said that he had gone through periods of being homeless and he was trying to get back on his feet," Ross said, calling the elimination of debt a huge relief. Ross said the group has $200,000 left to spend, and they hope to target student loan debt next.